Kawasaki Ninja 400 - a closer look | IAMABIKER - Everything Motorcycle! We saw the spy pics earlier this year and now the Kawasaki Ninja 400 has been unveiled at the Tokyo Motor Show 2017. Lets take a detailed look at this new Kawasaki. The all-new sporty 399 cc engine is tuned to deliver greater performance than its predecessor, the Ninja 300, accompanied by a smooth and predictable throttle response. The new engine is comparable in size to that of the 2013 – 2017 Ninja 250. While being just 100 cc larger, the capacity increase is just one part of a fundamental upgrade delivering improved power, torque, chassis stability and suspension compliance moving entry level Ninja riding into a completely new arena. It now produces 45 PS @ 10,000 RPM and 38 Nm @ 8,000 RPM. The Ninja 400 features a trellis frame similar in design to that of the Ninja H2. Kawasaki’s advanced dynamic rigidity analysis was used to ensure optimum rigidity with light weight. The engine is rigid mounted and used as a stressed member. The new frame design contributes significantly to the bike’s low curb mass. The lightweight design of the new engine and frame, plus extensive efforts to minimise weight result in a kerb mass of only 168 kg for the Ninja 400 (8 kg lighter than the Ninja 300) – weight on par with single-cylinder models. 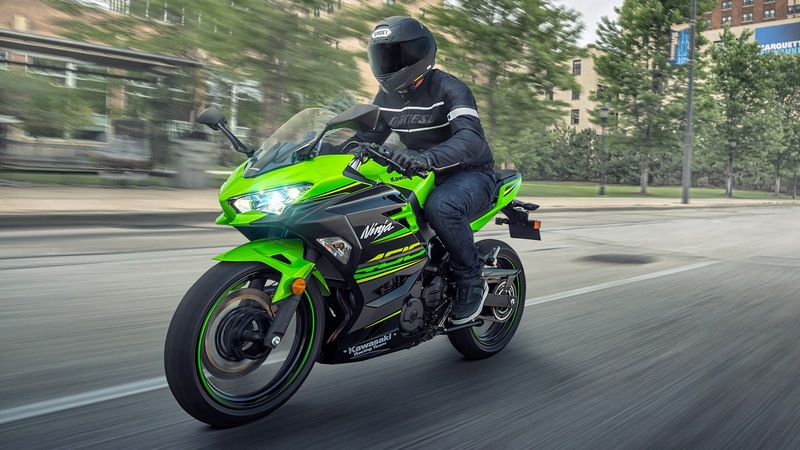 Measuring 310 mm (the same disc size used on the Ninja ZX-14R), the Ninja 400’s semi-floating front disc offers sure stopping power. A rigid new front brake master cylinder helps eliminate ineffective (idle) stroke, contributing to controllability, while carefully selected brake hose dimensions and material contribute to brake touch. Featuring the latest ABS unit from Nissin, the most compact and lightweight available. It also has a more rigid 41 mm telescopic fork which delivers better suspension action. While seat height is 785 mm, the slim design of both the seat (30 mm narrower) and the rear of the engine gives riders an unobstructed line for their feet to reach the ground. In addition to contributing to the Ninja 400’s sharper looks, slim LED headlamps (each featuring low and high beams, as well as a LED position lamp) are highly visible and offer significantly increased brightness. The new Ninja 400 surprisingly but understandably is equipped with the same instrument cluster as the Ninja 650, contributing to the high grade feel of the tidy cockpit. Now, at this point we can safely assume that it will replace the Ninja 300 in India in the coming months. But the Ninja 300 and Ninja 650 / Z650 are already quite closely priced and a substantial increase in price for the Ninja 400 would make it confusingly priced for India.